State of City County Schools: 11:30 a.m. to 1 p.m., 25 E. Auglaize St., Wapakoneta. Registration $12 at admin@wapakoneta.com or 419-738-2911. 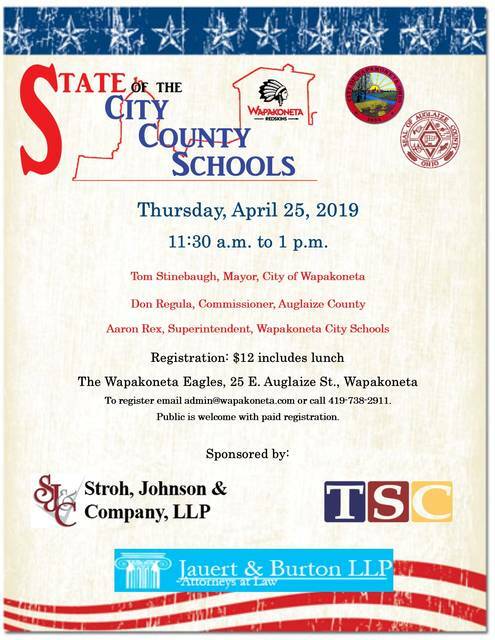 WAPAKONETA — The State of the City, County and Schools will be from 11:30 a.m. to 1 p.m. Thursday, April 25, at the Eagles, 25 E. Auglaize St., Wapakoneta. The speakers will include Wapakoneta Mayor Tom Stinebaugh, Auglaize County Commissioner Don Regula and Superintendent of Wapakoneta City Schools Aaron Rex. Registration is $12, and includes lunch, at admin@wapakoneta.com or 419-738-2911.